Last week I attended a large property on the Audley End Estate where I was booked to sweep three large open fires and a large Clearview Wood-burning stove. Everything was fine until I started to sweep the chimney in the main sitting room. There I found that the Rooks had been busy over the last year, or more likely a number of proceeding years come to that! From three meters from the bottom of the chimney right to the top there was a compacted birds nest. Compacted more so because although the chimney was 11 meters high, it had a relatively small diameter of flue. I used a combination of a pig’s tail and rods, and power sweeping with a metal flail to remove the nest and I had all the material removed within an hour and three quarters. 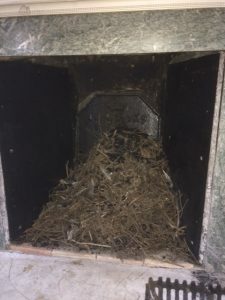 Fortunately for me at times during the sweeping process, I was able to dislodge large sections of nest in one go, which dropped down the chimney in big clumps. All in all I removed 10 and a half large trugs of material; which included twigs of various sizes, feathers, one mummified bird and lots of soot and tar, without making any mess. A job well done I felt. I recommended that the owner have a pot and anti-bird cowl fitted to the chimney stack to prevent similar nest building in the future.